This disc of unaccompanied choral music is the latest offering from the Chor des Bayerischen Rundfunks under direction of Peter Dijkstra. Since Dijkstra became artistic director of the choir in 2005 a fruitful partnership has been forged resulting in several excellent recordings. Probably their finest achievement is their stunning 2010/11 Fauré Requiem coupled with Poulenc’s Quatre Motets pour un temps de Pénitence (Four Motets for a Time of Penitence) on Sony Classical. 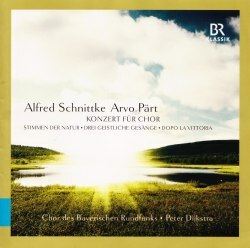 There is an abundance of excellent singing too in their 2007/08 recording of the Frank Martin Messe für Doppelchor; Kodály Missa brevis and Poulenc Litanies à la Vierge Noire also on BR Klassik. The foundation of Alfred Schnittke’s works is based solidly on traditional forms and eclectic styles. He holds a leading position among twentieth-century composers for the compelling expressive quality of his music. Living predominantly under the strictures of Soviet cultural policy Schnittke suffered from disapproval by the authorities for being too West European influenced. The increasing opportunities that Glasnost presented in Soviet Russia assisted Schnittke’s emergence as a composer of international note. In the field of unaccompanied sacred choral music he has been especially effective. Considered by many as a choral masterpiece Schnittke’s Konzert für Chor (Concerto for Choir) is an extended setting of words taken from the third chapter ‘The Book of Lamentations’ by the Armenian monk St. Gregory of Narek (951-1003). Scored for large choir, this four movement score was written in 1984/5 and premièred by the USSR State Chamber Choir directed by Valery Poliansky in 1986 at the Pushkin State Museum of Fine Arts, Moscow. It is sung throughout in Russian. The lengthy opening movement contains a number of full-blooded climaxes. The briefer second movement is sung with intense concentration that is at times hypnotically compelling. Highly technically demanding, the substantial third movement is expertly rendered with the sopranos and altos sounding especially haunting. The melodically appealing final movement develops a surprising depth of intensity over its short span. A few years earlier Valery Poliansky had requested Schnittke to write a work for his choir. In response Schnittke wrote the Drei geistliche Gesänge (Three Sacred Hymns) selecting texts from the Russian Orthodox Church. It was the commissioner of the score who directed the Russian State Symphony Capella in the first performance in 1994 at Stockholm. Sung here in Russian the opening hymn ‘Hail to Thee Virgin Mother of God’ is a beautiful work splendidly done as is the intensely reverential second hymn ‘Lord Jesus, Son of God’. The third and final hymn ‘Our Father’ is highly appealing with the Bavarian radio choir making a strong emotional and devotional impact. From 1972 the Stimmen der Nature (Voices of Nature) is a single movement vocalise, without words. It was penned for ten female voices and vibraphone. The Moscow Conservatoire Students’ Choir directed by Boris Tevlin introduced the piece in Moscow in 1975. Lasting just over four minutes it opens amid hushed mystery. I love the way the female voices convey an etheral sense of floating on air. Like Schnittke the Estonian Arvo Pärt, his slightly younger contemporary, was also condemned by the Soviet authorities. Pärt’s later music at its finest has the ability to communicate an intense and moving spirituality. I recall an affecting performance a few years ago of Pärt’s Berliner Messe played during an actual Sunday service at the Michaelskirche, Munich. Pärt’s little cantata Dopo la vittoria (After the victory) for choir a cappella was completed in 1997 - a commission to mark the 1600th anniversary of the death of Saint Ambrose, a Bishop of Milan. Lasting almost ten minutes this cantata is divided into seven sections playing continuously. With the chorus singing the Italian text the work opens in a style that reminded me of a Christmas carol. The Bavarian radio chorus sing with a splendid combination of breadth and veneration. Even so I found this generally less interesting than the Schnittke works. Peter Dijkstra is a master of choral forces and his talented Bavarian radio choir perform persuasively and with compelling devotional intensity. Nothing seems unduly forced. The sacred text is vividly projected with the voices blending splendidly and with immaculate intonation. Recorded over a number of sessions in 2011/12 with sound quality as admirable as this one understands why the stunning Hercules Hall in Munich remains such a desirable recording venue. None of the sung Russians texts are included; only the Italian text toDopo la vittoria. Gratifyingly full translations are provided in German and English. I count these wonderful performances as among the choir’s finest achievements to date.